OK, well, not really a new identity, just a new ID tag. Actually, I’ve had it for a while but I forgot to tell you about it. Back when we knew we were moving and mom wanted me to start going places with her, she got me an ID tag. Only trouble is, she thought we were moving to Orange, CA, so that’s what my tag said. Instead, mom ended up “retiring” and moving to northern California so we needed new tags. Mom likes these tags from the pet store because they are convenient and you get them on the spot, but they are limited. As you can see, CA would not fit on the new tags. Her name and phone number are on the back. My new tag without the CA! Now, I don’t know if I agree with this ID tags for cats business because I have a microchip too, but mom says we need all the help we can get if we accidentally get out, especially in a strange place where we don’t know our way around. She said some kitties will get so scared that they will run and run and run and end up a long way from home. I think I would just go somewhere and hide! Mom says she doesn’t want to find out so no Houdini stuff, whatever that means. I follow a lot of kitties on Facebook and a few of them have escaped from their homes and gone missing for a while. We were all so worried about them! Fortunately, they all were found, except for one who has been missing for more than three years. His owner still actively searches for him. Have you known kitties who got out and were lost for a while? How were they found? Tagged big change, cat, Christy, collar, ID tags, michrochip. Bookmark the permalink. Purple is definitely your color Christy! Looks beautiful with your furs. We’ve never known a kitty who went on walkabout and never returned. I only go outside under supervision and if it’s dark out, only on my leash and harness so no way will I ever get lost. I don’t wear a collar though. Nice tag´s your mom-person got for you ! I have a microship and when I go out I´m alway´s in harness and leash. Purple looks great on you! All our collars have been conveniently lost. The Baby escaped a few years ago and she was gone for two LONG days…it was awful! Mommy was never so happy to see her at the back door. We’re glad you have tags to help you get home. I have a microchip but TW is so scared I’ll get out. I never was innersted in going to the door until I saw Bijou, the door next door. Now I try to go out whenever she does. 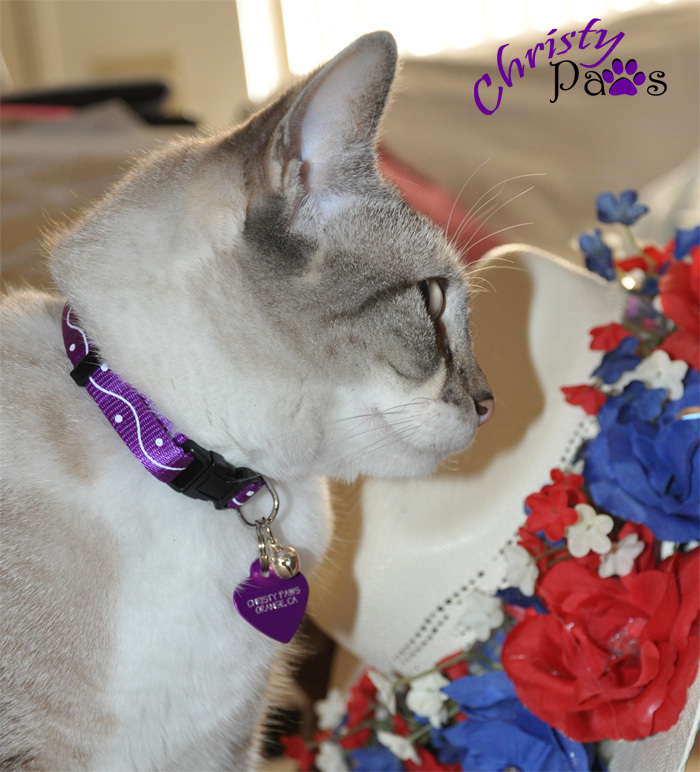 We love your collar and new tag, Christy. 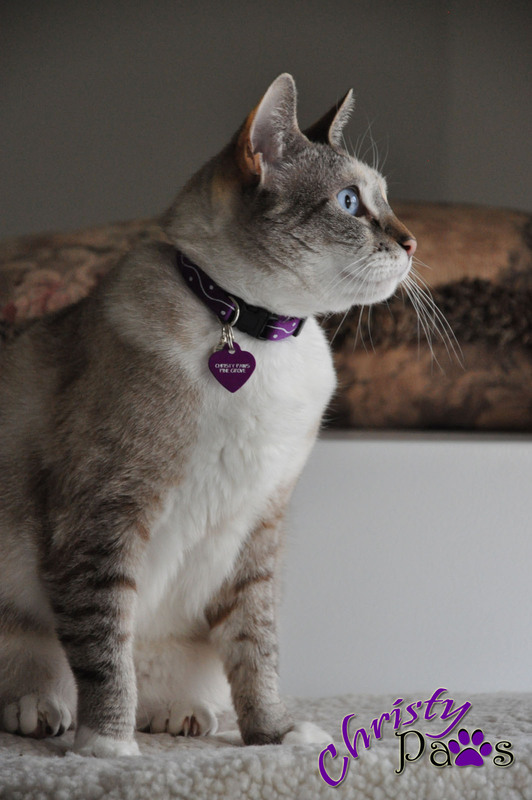 We wear collars and tags too, even though we don’t go outside. But you never know, right? We do know kitties that have gotten lost for awhile…like 2 weeks or more. Their humans were very diligent and kept looking and searching for them, trying everything they could to have the kitties come home. And they did come home. Thank cod. Yes, that’s what mom says, you never know. Glad the kitties you know who were lost came home! Hi Christy, I have a microchip, but mum won’t put a collar on me as I am very active outside and she is afraid I might get it caught on something and strangle me! I think for most cats a collar is a good thing as well as a chip! Mom doesn’t really like collars either but she calls them a necessary evil. All our collars are the special kitty break-away kind. Very nice, I hope you never get lost though. christy…de food serviss gurl wood haza panic times 98 if we getted looze….we iz just out side de city…..coyotes roam…two manee cars, highways, streetz & traffic…. Oh no! So glad you were found. Thanks for the link. I think your new ID tag looks really nice on you! Other kitties are going to be jealous of your new bling. Of my two kitties, only Manna has ever wandered outside. She has never gotten lost though. She used to dart out the door after us, but she never got far before we caught her. My Dad has had kitties get lost, but he never did find either one. Thanks for the compliment on my bling! So glad Manna never got lost when she wandered out. I has a heart like that too, only in red. I am also microchipped. M thinks like your human; she doesn’t want to take any chances. I have snuck outside a couple of times but only sniffed around in my backyard. Oh, I’m so glad you didn’t go any farther than that by yourself, Mario. So far, I think it is a scary place out there. I’m microchipped and don’t regularly wear a collar (since I compete in shows, it would dent my fur), so my human does worry. I do wear a harness when I go out, and my human’s getting tags for my harnesses, in case I somehow get away from her.